When we were considering finishes and textures for the AERIN fall collection, I looked to some of my favorite interiors in London and Paris, where velvet is used beautifully for sofas, throw pillows, and wall coverings. I love the rich, tactile finish of this luxurious fabric. 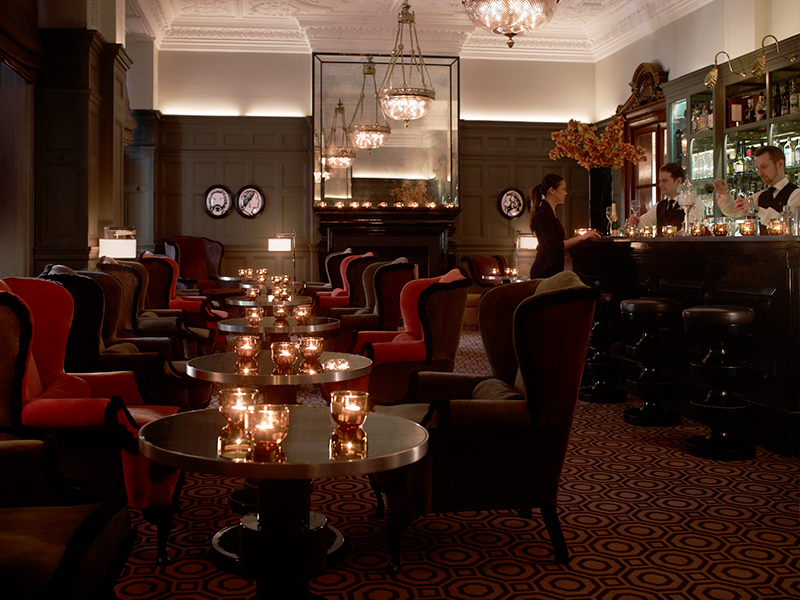 Claridge’s Fumoir Bar in London’s Mayfair, is a perfect spot for a nightcap. 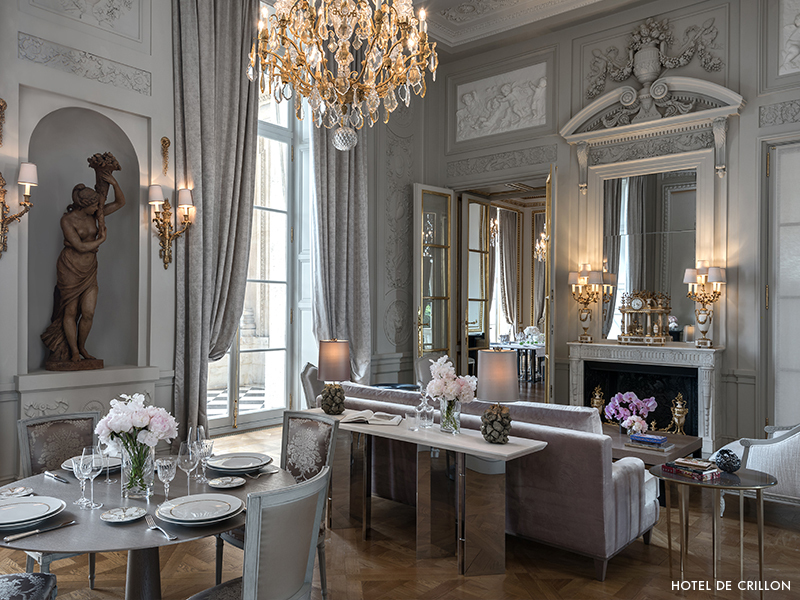 Designer Thierry Despont created a tiny gem of a space, tucked off the hotel’s lobby behind panels of exquisitely etched Lalique crystal, by lining the walls with tufted velvet banquets in dark purple. Around the corner, at the Connaught Hotel’s Coburg Bar, Parisian designer India Mahdavi has grouped wingback chairs in a rich palette of burgundy, purple, and mink velvet trimmed with black fringe. This subtly lit, cozy space is a lovely spot to grab a cocktail and get lost in conversation. 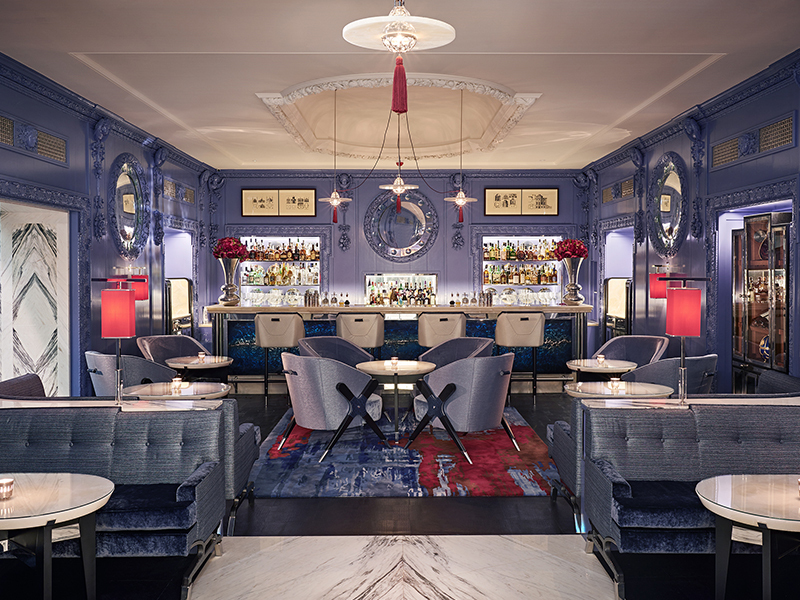 The Blue Bar at The Berkeley Hotel, in London’s Knightsbridge neighborhood, was named after the striking blue paneled walls that were originally installed by Sir Edwin Lutyens and painted by the late interior designer, David Collins. In homage, the bar’s cocktail menu is categorized by colors, with each one reflecting a different style of drink (green is long and fresh, blue is crisp and clean, yellow is elegant and effervescent, red is rich and complex). 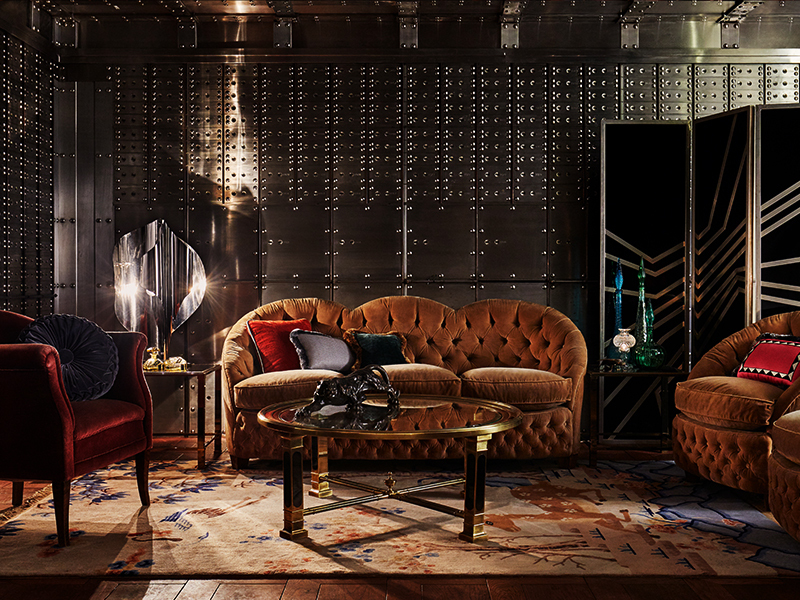 With the recent re-design by Collins’ protégé, Robert Agnell, the room’s once silk upholstery is now sheathed in a rich velvet-like fabric that Agnell had custom made exclusively for the space. Another London hotel, The Ned, was recently opened in an historic Edwin Lutyens building by the Soho House Group. The rooftop is for hotel guests and members-only but the immense ground floor has multiple lounges and restaurants with abundant velvet furnishings. I love the emerald green cut velvet banquets and brass-trimmed, coral-hued ottomans. 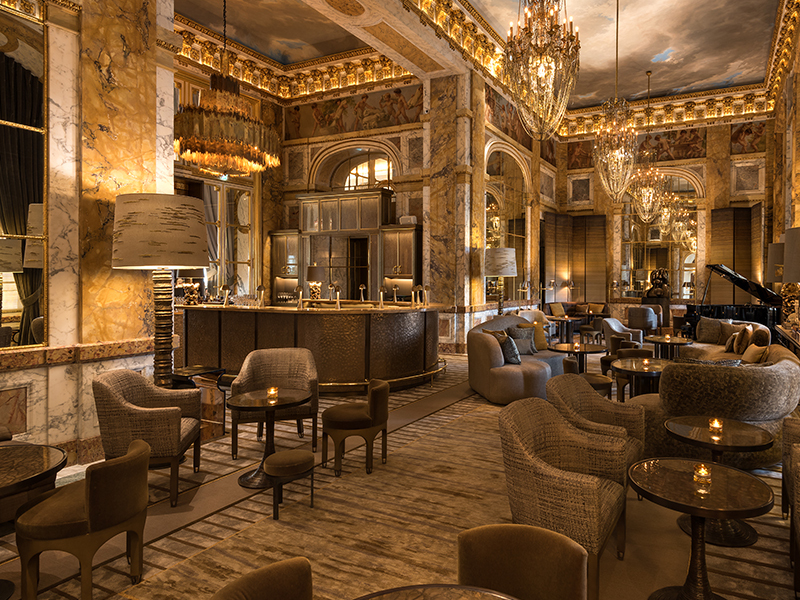 The Hotel de Crillon in Paris reopened recently after an epic restoration, which included an all-star team of designers, including Aline d’Amman, Tristan Auer, Cyril Vergniol, Chahan Minassian, and the legendary Karl Lagerfeld. The result is a wonderful mix of ultra modern and antique furnishings. Velvet pervades the opulent space with a lovely soft color palette of pale grey, cloud blue, muted purple, and chalky brown. 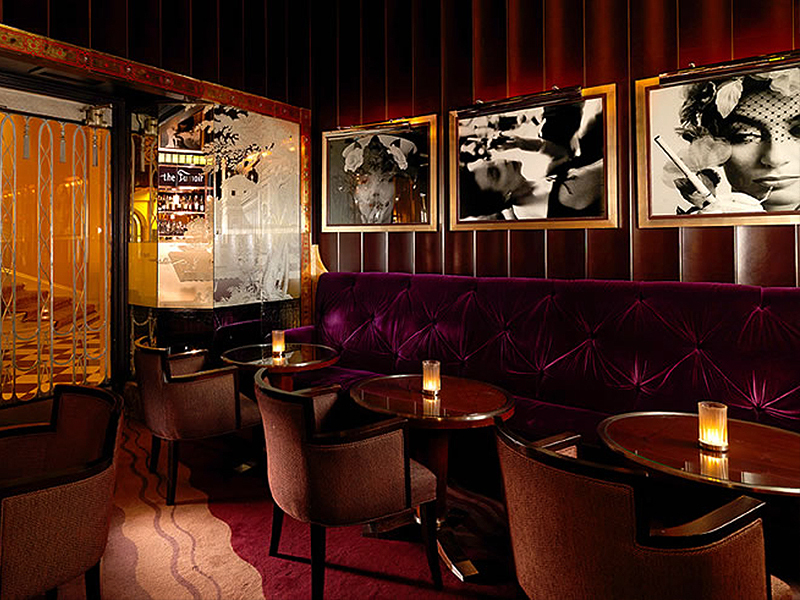 Minassian’s Ambassadeurs bar, with its low-slung velvet slipper chairs and curvy crushed velvet sofas, is no exception. The AERIN Valentina collection includes stacked and single-layer jewelry boxes and picture frames in Dusky Rose and Whisper velvet. These subtle shades have also been used for the plush finish of the Beauvais range’s jewelry boxes.